August means back to school for Delray Beach! Although back to school can feel exciting for many, especially parents, the toll it can take on our behavioral health is impossible to ignore. With that in mind, HDB’s focus this month is back to school. But we haven’t just been posting on social media and sharing important statistics with the community, we’ve been there supporting the community. 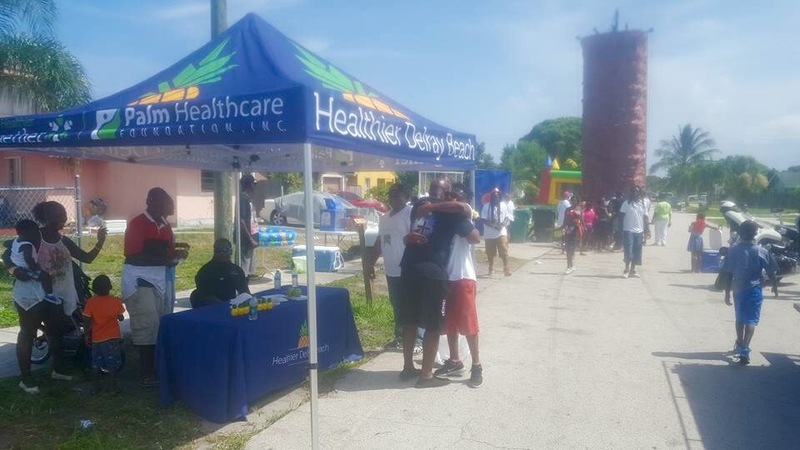 Our first stop on the Back to School event circuit was the Haitian Community Health Fair at Toussaint L’Overture High School on July 30th. Parents and children spent the day receiving health screenings, shopping the donated supplies brought by vendors, and even getting fitted for bike helmets. Many of the vendors were focused specifically on the needs of the Haitian population and even more spoke Creole. Bringing help to where people are in a way that’s tailored to them is perhaps the most effective way to support the community – and it showed. Our second stop was the Spirit of Giving Back to School Bash at Village Academy. Here students had the chance to pick from a line up of bright colored backpacks, shoes, and supplies while parents heard from health vendors about services, supports, and, of course, behavioral health initiatives. While one part of HDB supported the Back to School Bash, one of our first Ambassadors, Dupree Jackson, manned the HDB table at the Frog Alley Guns Down Kids Up Block Party. This event focused on fostering a sense of solidarity and nonviolence among the residents of Delray Beach. The block party was inspired by the potential that Delray Beach has, and that can be felt, to be a truly connected and supportive community. We rounded out our Back to School tour with the Back 2 School Splash at Catherine Strong Park on August 13. Two days before school started, this event served as a sort of last stop before the school year kicked off. With a DJ and the water park there was certainly a sense of community among parents and students as they picked out backpacks and relaxed before the school year kicked off. So, why participate in all these events? Sure, it’s great to see these young students able to walk away with the supplies they need to be successful in school. But its not just the heaps of donations from organizations and individuals that makes these events so special. What’s special is watching Delray Beach support itself. Whether that support comes in the form of donated school supplies, social services, health services, or even a friendly hand that says, “let’s do this together” doesn’t matter. What matters is that this sense of community is there.